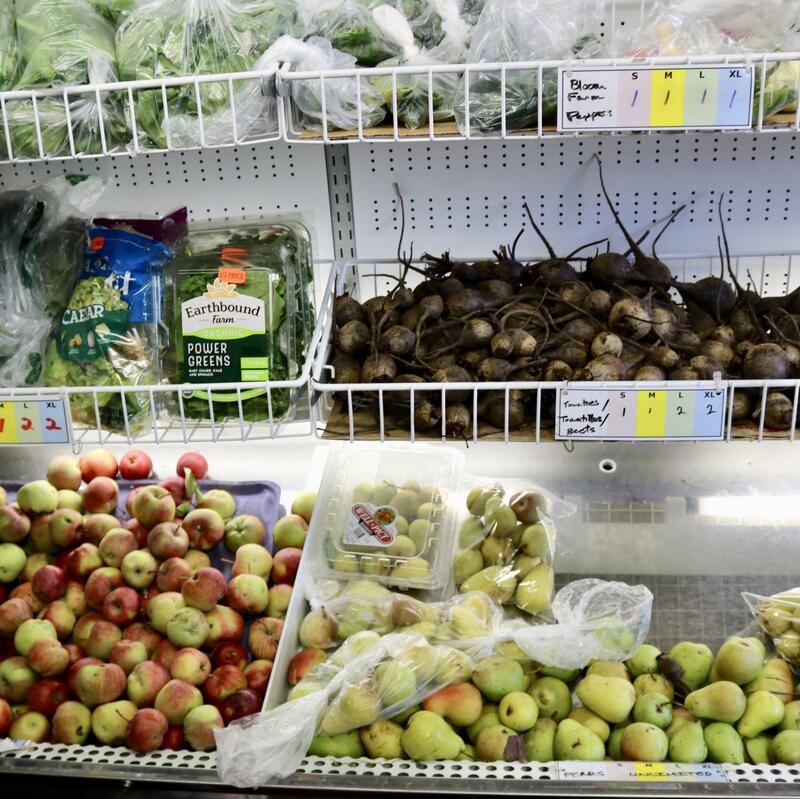 There is a growing emphasis on fresh produce among the food items made available at the Hunger Coalition in Bellevue, Idaho. People tend to think about the hungry during the holiday season, when organizations participate in canned food drives. In the Wood River valley, though, they want to change people’s perceptions about when to think about the hungry and how to think about their food. On a sunny afternoon in the town of Bellevue, Brooke McKenna looks over her computer out into a waiting room of about a dozen people. She’s the Director of Operations here at the Hunger Coalition. When clients walk in, she takes their card, enters them into her computer and assigns them a number. When the number is called, they get to push a shopping cart down through an aisle of shelves stocked with food. This is a “distribution” and it happens three days a week. “Today is going generally pretty well," she says. "It’s about 15 to 30 minutes wait time on average. We try to go as quickly as possible, but you can see the volunteers take them through one-at-time, so there’s just a little bit of a slow process." A young woman and her child walk through, filling their cart, as Volunteer Eleanor Ward guides them. Ryan Weninger and Kristin McMahon prepare for a food distribution at the Hunger Coalition in the Wood River Valley. “And we have all this soup. You can take eight cans. You can get chicken noodle and tomato. You can get eight cans of whichever you want." The woman throws the cans in her cart and moves along; she has been through this line before. "Canned beans or dry beans?" asks Ward. "And either a loaf of bread or tortillas. At the end here, we have diapers, toothbrushes, soap or deodorant." This scene plays out in food pantries across the country. But it seems surprising here, near Sun Valley, where you can find multi-million-dollar homes and a famous 82-year-old ski resort. But that outside polish masks a cold hard truth. “We are living in the eighth-most expensive county in the nation for food," says Jeanne Liston, executive director of the Hunger Coalition. Service industry wages are often low and not reliable year-round. Plus, there are limited housing options. In fact, 0.3 percent of housing here was built since 2010. And much of it is out-of-reach, says Liston. Blaine County, like elsewhere in Idaho, is enjoying period of low unemployment right now. Workers are in high demand. 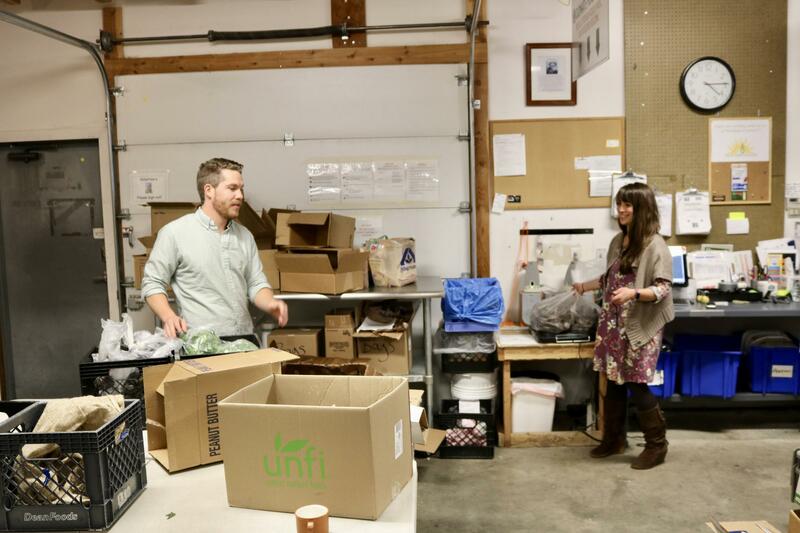 The warehouse at the Hunger Coalition in Bellevue, Idaho, includes dry goods and fresh food. And labor is seasonal, with tourist peaks in the summer and the winter. But in 2018, even those typical calendar trends aren’t playing out here. Crowds have gathered in this waiting room all year long. Ryan Weninger is the warehouse supervisor at the Hunger Coalition. He explains most of their food, surprisingly, is not donated but purchased. And at a discount. "So a nice thing, we work with a lot of the local groceries," he says. "Both on a donation side. A lot of them love to donate to us instead of just throwing food out. But beyond that they work really closely with us on the purchase angle. About 80% of our total food output is purchased. And that can put a strain on us financially speaking." Jeanne Liston and Kristin McMahon of the Hunger Coalition in front of the fresh produce shelves at their facility in the Wood River Valley. And their pantry isn't just filled with canned goods, like you might find in other communities across the country. Weninger describes their commitment to offering fresh food. "So, this is our walk-in fridge," he says, using the lever to open the large metal door. "This is where we store most of our produce, whether its donated or comes from our farm,"
He points across the room. "Over there, we have our freezer. That’s where we store most our proteins. And we’re one of the unique food pantry set ups that does offer that, which is really cool, I think." It’s not just fresh produce in there, but fresh meat. “Actually our freezer is stocked with ground elk right now, thanks to some of the local hunters who donate some of their kill," says Kristin McMahon, who handles communications. She says their clientele can’t be characterized as those living in extreme poverty. The Coalition serves many lower middle-income families, from what she calls the ALICE population: Asset Limited, Income Constrained, Employed. She says that 35 percent of the county’s population is either considered food insecure or one crisis away from that status. The Hunger Coalition, which started as an all-volunteer organization, is celebrating 15 years. And Jeanne Liston, who joined as their first paid employee in 2007, is still surprised by the broad nature of food insecurity. And the negative stigma of asking for a grocery cart of free food is something they battle every day. So they’ve changed their approach. Liston put out a survey in 2015. "Forty-six percent of the people responded to a survey that we sent out that no matter how bad it got they would never seek emergency food assistance," she says. "But they would be willing to work or volunteer in exchange for food." It was like a lightbulb went off. They weren't reaching all the people that needed them. Volunteers would work in the garden outside or at Bloom Community Farm in Hailey, in exchange for some of the harvest. In 2017 they were expecting a modest launch. 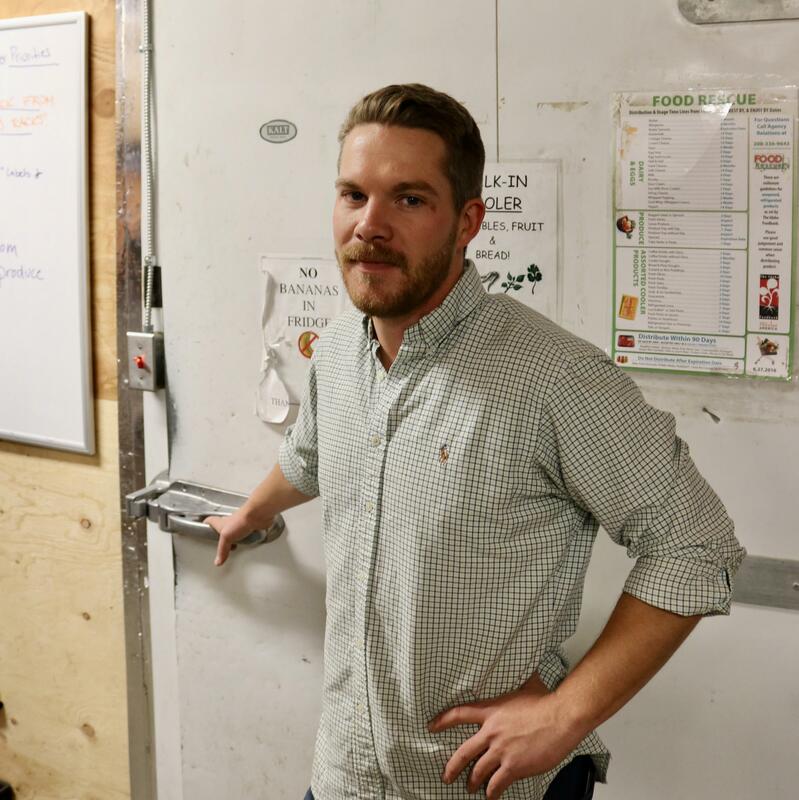 Ryan Weninger at the walk-in cooler at the Hunger Coalition in Bellevue, Idaho. 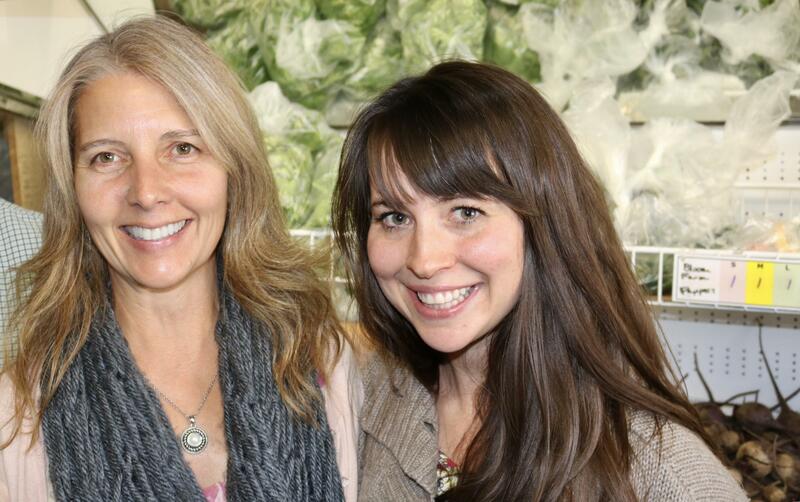 "Last year was our first year with the Volunteer for Veggies program. And we were hoping to get 25 people out on the farm volunteering. And we ended up with 229." So they started to chip away at the stigma in other places. Their big orange truck that goes around town doesn’t say “hunger” or “food bank” anywhere on it. It is stocked with fresh food and shelves of books. Plus, the way they wanted the public to see their clients has totally changed, says McMahon. “We also worked behind the scenes to evolve our brand and our message. So not so much using the demoralizing language of people 'in need' or 'the hungry.' But more talking about people who are faced with adversity and having to make these kind of heroic journeys in order to just put food on the table and to make it through the day-to-day. And that’s really impressive. And those are some of the strongest people you might encounter." Plus, they are also some of the youngest. Over the past five years, 30 percent of Blaine County households included children. "So last year," Liston explains, "we provided food to 1-in-5 people in our community and over half of them were children." In Blaine County, an estimated 73 percent of households with children receive subsidies from the federal program SNAP, the Supplemental Nutrition Assistance Program. And teenagers are an important component of their volunteer farm, helping to instill a sense of value and pride as they pass into adulthood. According to Feeding America, there are higher rates of food insecurity elsewhere in Idaho, across the northern counties of the panhandle. But the average meal cost in Blaine County is still the state’s highest. And even in this era of cheaper and cheaper food, there is a commitment here not to sacrifice nutrition for calories. And not to sacrifice dignity just to fulfill a need. In Idaho, 17 percent of people don’t have access to enough food for an active, healthy life. That’s according to the hunger relief charity Feeding America. The Idaho Foodbank tries to help by partnering with food pantries around the state. But when there’s no pantry available, residents are left unserved. That's where the Foodbank's mobile service comes in. A new report shows the number of people dealing with hunger in Idaho has dropped overall. But children in some parts of the state are still struggling to get enough to eat. The annual study by Feeding America – a national network of food banks – shows that overall food insecurity in the state has decreased incrementally.